One common observation from these studies is that the optimal number of beams that strike a correct balance between plan quality and delivery efficiency is highly dependent on the case complexity. However, till date, user does not have a systematic and case-specific way to choose the number of equispaced beams in IMRT, thereby increasing inter-user variability in plan quality. 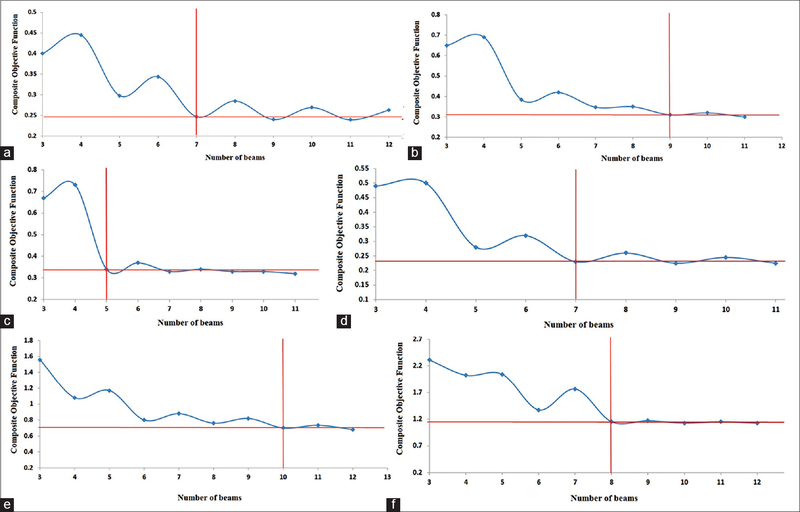 Moreover, in complex clinical situations, it is not easy to decide an appropriate number of beams without many trial-and-error approaches potentially involving some backtracking steps. Apart from being an independent problem, BNS has also become an important step before optimizing the beam angles because many of the current BAO algorithms require the input of an appropriate number of beams for a given plan. Our motivation is to arrive at a systematic method for determining the number of beams so that a computer program can be used to automatically determine the number of beams within a reasonable amount of time. To this end, we propose an algorithm for fully automated and case-specific selection of optimal number of beams in IMRT. The number of equispaced beams would be seven in all the cases. [Table 1] lists the other reference conditions to be adopted before invoking SBBNS algorithm. Seven beams are used in the reference condition as it allows sampling a good portion of the target volume and other normal organs over 360° rotation. Moreover, seven beams in a plan do not prolong the dose calculation and optimization significantly. where θi is the gantry angle of beam i, N is the number of beams, and θ1 is the starting gantry angle or gantry angle of the first beam. Step 1: SBBNS algorithm takes as input the clinical dose-volume objectives and calculates the objective sensitivity with respect to a predefined change in the prescribed target dose. Step 2: The estimated sensitivity of the objective function is used to calculate optimal beam number for the given case. where r represents the r th objective function component (OFC), Drand Vr represent the dose and volume parameters for the r th OFC, respectively, and Wr is the importance or penalty factor for the r th OFC. f (Dr, Vr) is the numerical value of the r th OFC. Essentially, an OFC represents a quadratic difference between user-specified clinical goal and obtained dose at each voxel multiplied by the importance factor assigned to the voxel belonging to a region of interest. In the SBBNS method, we define Drand Vr as the clinical goal (i.e. the &##8220;real objective”) for the r th objective component. The square root function is used because DMPO objective function is essentially a quadratic function over dose and volume parameters. Here, l is a linearization factor applied to linearize the numerator value, whose value is decided based on Fnormal. The value of l is decided in such a way that falls in between 0.1 and 1. The same linearization factor will be applied to Foverconstrained term as shown in equation 3. For instance, if Fnormal is 0.x, l is set to 1; if Fnormal is x, l is set to 10; if Fnormal is 0.00x, l is set to 0.01; if Fnormal is x00, l is set to 1000, and so on. Here, x denotes an arbitrary integer. Essentially, the sensitivity of objective function (equation 3) measures how much the objectives of surrounding critical normal structures are compromised for any change in the prescribed PTV (target) dose. The overconstraining of target minimum dose results in sacrificing the sparing of other structures, as a result of which, Foverconstrained is always greater than Fnormal. Such sensitivity-based approaches had been used earlier for automated determination of IMRT objective function parameters , and selection of optimal beam angles in IMRT. 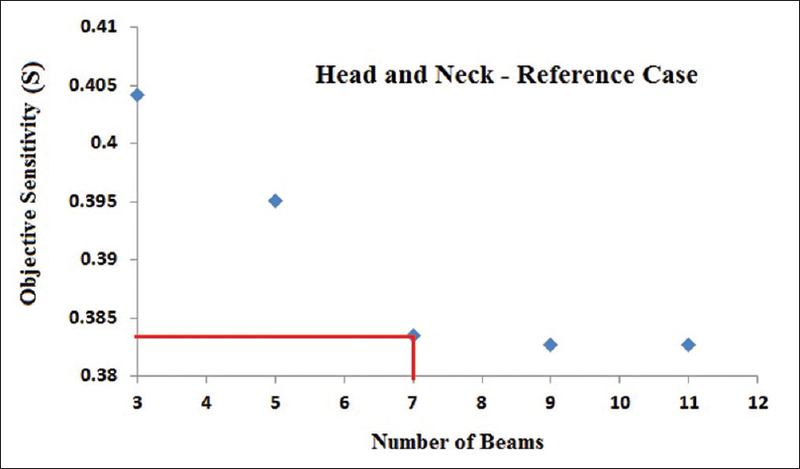 We verified the relationship between objective sensitivity and number of beams in a chosen head and neck anatomy as shown in [Figure 1]. It is clear from this figure that the objective sensitivity is inversely proportional to the number of beams. where denotes the known optimal beam number for a reference case under reference beam geometry condition. In this work, we chose a moderately complex head and neck case as a reference and applied the reference conditions mentioned before to calculate beam number constant k. To find out Noptimal for this case, objective function saturation curve is plotted [Figure 2]a for different beam numbers starting from 3 to 11 and an optimal beam number is chosen for the reference case. From [Figure 2]a, it is evident that at beam number seven the objective function approximately saturates. Meanwhile, S was calculated for this case as explained in step 1. Using the above value of k in equation 4, it gives the optimal number of beams. Equation 7 gives the final expression for the optimal beam number required regarding sensitivity of the objective function (S) obtained for a given head and neck case using equation 3. The whole process involved in SBBNS algorithm is illustrated in [Figure 3]. We used five head and neck cases for which optimal number of beams is to be found. 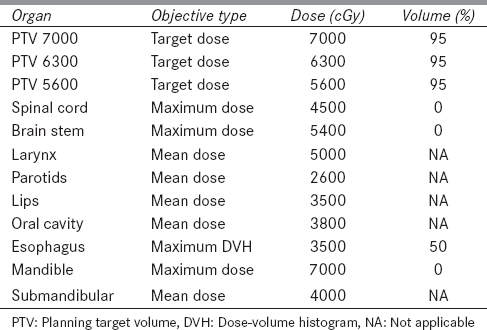 The cases chosen in the study have a wide range of complexity in terms of tumor geometry, normal tissue locations, and dose and dose-volume objectives. [Table 2] gives the typical clinical objectives for the head and neck cases. To validate the proposed algorithm, we independently determined the optimal number of beams for all the five cases using objective function saturation curves. An objective function saturation curve is a graphical illustration of how the composite objective function changes with respect to a number of equispaced beams (3–11 equispaced beams) used in the optimization for the same clinical objectives set for PTVs and OARs. In the saturation curve, the optimal beam number is chosen to be the point (in the graph) at which the objective function has approximately started to saturate. 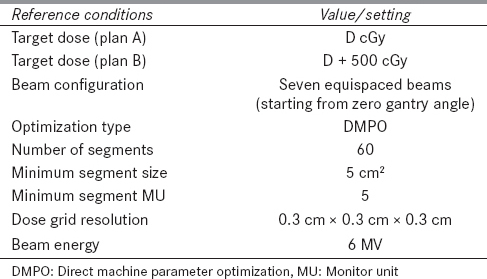 We considered the starting point of the saturation as optimal because adding more beams in the optimization beyond the saturation point has been found to be only increasing the total monitor unit (MU) of the plan without improving the plan quality. Quantitatively, the saturation point is considered to be a beam number (in the saturation plot) beyond which the reduction in composite objective value is not more than 10%. We used Auto Plan feature available in Pinnacle TPS Version 9.10.0 (Philips Radiation Oncology Systems, Fitchburg, WI) for all the DMPO optimizations, which automatically sets appropriate objective function parameters (dose, volume, and weight) for each objective. The number of segments input to DMPO algorithm before optimization was set as sixty in all the optimizations involving different equispaced beam numbers. [Figure 2]a,[Figure 2]b,[Figure 2]c,[Figure 2]d,[Figure 2]e,[Figure 2]f show the objective function saturation curves obtained for the head and neck cases. As mentioned earlier, the optimal beam numbers for each case is located by taking input from the saturation curves. At the same time, we used the proposed SBBNS algorithm to find the optimal beam number for the same cases using equation 7. 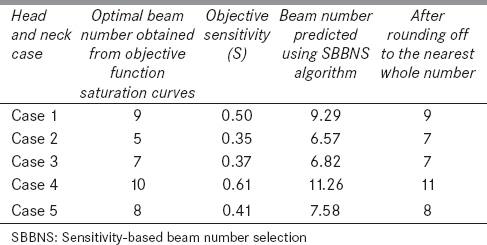 [Table 3] compares the optimal number of beams obtained using the saturations curves and the proposed SBBNS algorithm. We rounded off the number predicted by SBBNS to nearest whole number. It is evident from [Table 3] that the beam number predicted using SBBNS and saturation curves are in complete agreement for three cases (case 1, 3, and 5). SBBNS has predicted two additional beams for Case 2 and one additional beam for Case 4. The Pearson correlation test shows a correlation of about 0.9 between S and Noptimal(obtained from saturation curves) and a correlation of about 0.88 between Noptimal(obtained from saturation curves) and Noptimal(computed using equation 7). This result indicates that SBBNS method is capable of predicting optimal number of beams for head and neck cases with reasonable accuracy. Producing a good dose distribution fundamentally requires an appropriate selection of a number of beams and their angles. It has been reported that adding more beams in IMRT beyond a point increases the MUs without any considerable improvement in dose distribution, leading to more leakage radiation, and increased critical organ dose., At the same time, having an insufficient number of beams can result in sub-optimal treatment plan. Hence, determining a suitable beam number turns out to be a valid clinical problem that requires a case-specific solution. It is to be noted that the beam numbers determined using SBBNS algorithm are tightly coupled with the user defined objectives. Inputting simple and easily achievable objectives in SBBNS will result in a relatively lesser number of beams. Likewise, inputting complex objectives will result in a larger number of beams. Hence, it is important to ensure that the clinical objectives included in the optimization are reasonable and clinically relevant to fully make use of SBBNS approach for BNS. Auto Plan has been used just as a substitute to an expert planner in this study. In the absence of Auto Plan feature, a planner has to decide the objective function parameters to meet the clinical objectives. The clinical validation of Auto Plan can be found elsewhere., Moreover, the proposed SBBNS approach coupled with auto-contouring tools such as SPICE and automatic planning tools such as Auto Plan allows for a complete automation of the planning process once the clinical objectives are set. The susceptibility of beam number constant value (k = 18.32) to any change in the reference conditions mentioned in [Table 1] needs to be investigated. For instance, it will be useful to see how k-value changes if the starting angle is set as a nonzero angle. However, a huge change in k is not expected because the numerator of beam number constant term (equation 6) will change correspondingly to any change in the denominator term occurring due to alterations in the reference conditions. It is evident from the results that the algorithm is capable of predicting optimal beam number with reasonable accuracy. Although we included only head and neck geometry in this study, in theory, the method should also be applicable to other anatomic sites such as thorax and pelvis. However, a detailed investigation might be required to understand how the proposed beam number constant value changes according to anatomy. Rowbottom CG, Webb S, Oldham M. Improvements in prostate radiotherapy from the customization of beam directions. Med Phys 1998;25(7 Pt 1):1171-9. Schreibmann E, Xing L. Feasibility study of beam orientation class-solutions for prostate IMRT. Med Phys 2004;31:2863-70. Pugachev B, Boyer AL, Xing L. Beam orientation optimization in intensity-modulated radiation treatment planning. Med Phys 2000;27:1238-46. Hou Q, Wang J, Chen Y, Galvin JM. Beam orientation optimization for IMRT by a hybrid method of the genetic algorithm and the simulated dynamics. Med Phys 2003;30:2360-7. Gaede S, Rasmussen H, Wong E. An algorithm for systematic selection of beam directions for IMRT. Med Phys 2004;31:376-88. Pugachev A, Boyer AL, Xing L. Beam orientation optimization in intensity-modulated radiation treatment planning. Med Phys 2000;27:1238-45. Wu X, Zhu Y. A mixed-encoding genetic algorithm with beam constraint for conformal radiotherapy treatment planning. Med Phys 2000;27:2508-16. Li Y, Yao J, Yao D. Automatic beam angle selection in IMRT planning using genetic algorithm. Phys Med Biol 2004;49:1915-32. Narayanan VK, Vaitheeswaran R, Bhangle JR, Basu S, Maiya V, Zade B. An experimental investigation on the effect of beam angle optimization on the reduction of beam numbers in IMRT of head and neck tumors. J Appl Clin Med Phys 2012;13:3912. Popple RA, Fiveash JB, Brezovich IA. Effect of beam number on organ-at-risk sparing in dynamic multileaf collimator delivery of intensity modulated radiation therapy. Med Phys 2007;34:3752-9. Söderström S, Brahme A. Which is the most suitable number of photon beam portals in coplanar radiation therapy? Int J Radiat Oncol Biol Phys 1995;33:151-9. Bortfeld T. The number of beams in IMRT – Theoretical investigations and implications for single-arc IMRT. Phys Med Biol 2010;55:83-97. Fenwick JD, Pardo-Montero J. Numbers of beam angles required for near-optimal IMRT: Theoretical limits and numerical studies. Med Phys 2011;38:4518-30. Ranganathan V, Ranjan US. Apparatus for Determining a Number of Beams in IMRT. United States patent application, 2014; US 14/763539. Zhang X, Wang X, Dong L, Liu H, Mohan R. A sensitivity-guided algorithm for automated determination of IMRT objective function parameters. Med Phys 2006;33:2935-44. Vaitheeswaran R, Narayanan VS, Bhangle J, Nirhali A. TU-A-BRA-05: An algorithm for automated determination of IMRT objective function parameters. Med Phys 2010;37:3369. Vaitheeswaran R, Narayanan VK, Bhangle JR, Nirhali A, Kumar N, Basu S, et al. An algorithm for fast beam angle selection in intensity modulated radiotherapy. Med Phys 2010;37:6443-52. Jeong K, Bzdusek K, Kumar P, Tome W. SU-E-T-650: Evaluation of novel IMRT auto-planning tool for nasopharyngeal carcinoma cases. Med Phys 2013;40:355. Hazell I, Bzdusek K, Kumar P, Hansen CR, Bertelsen A, Eriksen JG, et al. Automatic planning of head and neck treatment plans. J Appl Clin Med Phys 2016;17:5901.